NEW YORK – Hello Giants fans, I would like to introduce you to the first ever Digital Advent Calendar (DAC) for the New York Giants on our website this Christmas. What this will do is change the nygreporter format for the entire month of December with daily articles and deeper analysis with holiday cheer. I plan on throwing in some cool mystery guests on certain days or trivia other days or something interesting under the ‘Holiday DAC’ titles, for each of the advent calendar days (25) until Christmas Day. Some family fun! Leave all your answers to the trivia questions in the comment area. Search the comment area for the correct answer given by me, usually within 48 hours of posting the trivia question. So, anything you see with the letters DAC in the title, represents the Digital Advent Calander. We encourage you to participate and leave comments below on what you liked and what you didn’t care for. It will only make us better next year when we continue the tradition. Don’t take this too seriously, just have fun with it. There are no prizes for correct answers, this is for bragging rights only. An interesting holiday fact about the Giants holiday games, is they won their first ever holiday game when they played the Brooklyn Lions (Lions were the home team) on November 25, 1926. The New York Giants beat the Lions 17-0 on turkey day over 80 years ago, pretty crazy huh? I was very surprised when I learned about how many Christmas games the Giants have played in. I was equally surprised when I learned about how many Thanksgiving day games Big Blue has played. Both of these facts represent the trivia question below. RD – nygreporter.com – Happy Holidays! 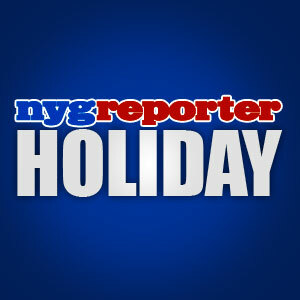 nygreporter will be taking a break the week following Christmas (12/26-12/30). The Week 16 Game Notes article for 12/24/11 will be a published on 12/26/11, because I’m going to the Christmas Eve game against the Jets. We will also do a report for New Years Eve and day. God Bless! This entry was posted on Thursday, December 1st, 2011 at 12:01 PM and is filed under 2011 Fantasy Football, 2011 New York Giants, 2011 NFL Playoffs, 2011 NFL Regular Season, Big Blue, Chris Mara, East Rutherford, Eli Manning, G-Men, Giants, Giants Coaches, Giants Draft, Giants Front Office, Giants History, Giants Roster, Giants Stadium, Jerry Reese, John Mara, Jonathan Tisch, Justin Tuck, Kevin Gilbride, MetLife Stadium, New Jersey, New Meadowlands Stadium, New York, New York Football Giants, New York Giants, NFC East, NFL, NFL New York Giants, NFL Playoffs, NFL Schedule, Nilay Shah, NY Giants, NYG, NYG Blog, NYG Charity, NYG Exclusive, NYG Fantasy Football, NYG Holiday, NYG Playoffs, NYG Regular Season, NYG Reporter, NYG Schedule, NYG Story, NYG Website, nygreporter, Pat Hanlon, Perry Fewell, Roger Goodell, Steve Tisch, Timex Performance Center, Tom Coughlin, Tom Quinn, Wellington Mara, Wounded Warrior Project. You can follow any responses to this entry through the RSS 2.0 feed. You can leave a response, or trackback from your own site. The answer is 14 and all of them Thanksgiving day games with no Christmas games yet. Pretty wild huh? If you find something that says otherwise, please let me know. Thanks!